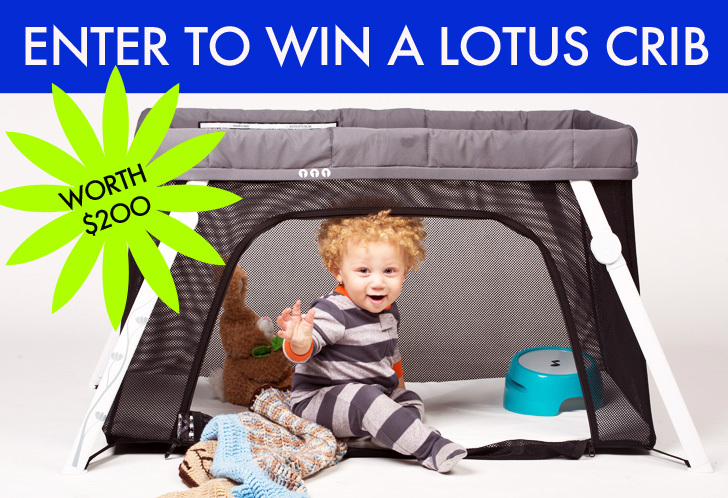 LAST CHANCE TO ENTER TO WIN: A Lotus Travel Crib & Portable Play Yard Worth $200! ENDING TONIGHT AT MIDNIGHT! Be sure to enter for a chance to win this fabulous crib! Getting out and about with your baby can be a tall order — but what if you could easily tote a travel crib and portable play yard in a backpack, so your little one has a cozy haven to sleep and play in, wherever life takes you? 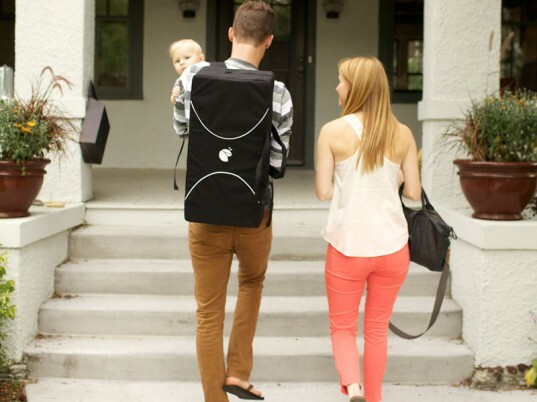 The new Lotus Travel Crib from Guava Family is a dream come true for parents. Weighing a mere 11 pounds and boasting a set-up time of less than 15 seconds due to its innovative, intuitive design (it practically ‘blossoms’ open, like a lotus flower), this ‘everywhere’ crib is compact and light enough to carry-on an airplane, or to take to grandma’s house, a friend’s dinner party, or virtually anywhere you need a pop-up refuge for your child. 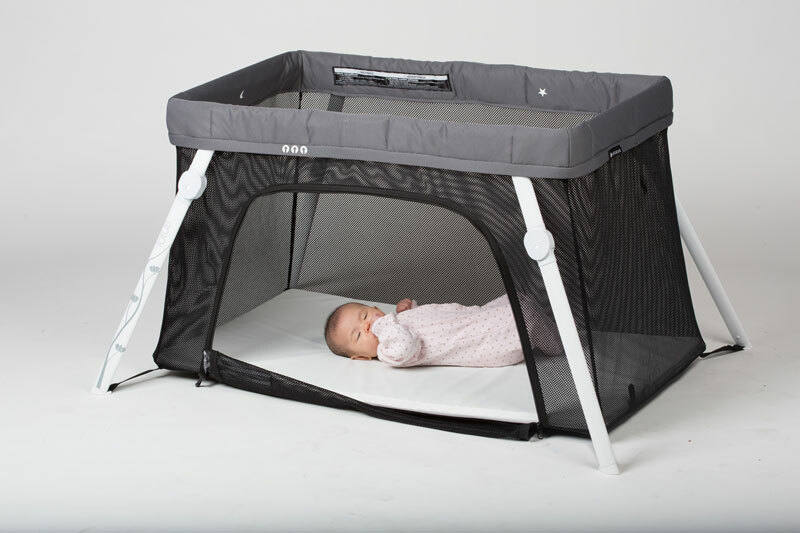 Designed for children ages 0-3, The Lotus Crib also features an ingenious side door that zips open and shut to be used for a variety of purposes. Mom can nurse baby in the crib, or dad can rock him to sleep, and then make a stealth exit through the opening before zipping it shut. When used as a play yard, older tots won’t feel imprisoned — they’ll see the Lotus as more of a special playhouse they may enter and exit freely. In addition to its sleek and modern, aesthetically pleasing design, the Lotus Crib is safe and non-toxic: free of phthalates and lead and it contains no PBE or PBDE flame retardants. It also features completely breathable ClearView Mesh all the way down to the mattress on each side to allow for full airflow and an unobstructed view of your child. Enter to win your very own Lotus Travel Crib, complete with mattress and carrying bag, after the jump! 1) Sign up for Inhabitots’ weekly newsletters (if you haven’t already)! We’ll be notifying the winner in Inhabitots’ newsletter – so you need to sign up and receive our newsletter to find out if you have won. 2) Like Inhabitots on Facebook, and Follow Inhabitots on Twitter. 3) Add a comment to this post with your answer to the following question: What is your favorite place to take your baby? Contest ends TONIGHT Monday, February 4th, 2013 at 11:59 p.m. EST. Winner will be announced in our newsletter on Friday, February, 8th 2013. Good luck! If you’d like to purchase the Lotus Everywhere Crib, take advantage of a $20 off discount using the coupon code: inhabitots. *Discount offer ends March 4th, 2013. I love taking my baby to a local bookstore we have in our city!! We love taking our baby to the park! We like going to the grandparents house right now, especially since its winter. In the spring, we will really enjoy visiting the forest and other parks and eventually museums! My favorite place to take my babies is/will be (preggo again) is our cabin in the mountains. It's not too far of a drive and it's so nice to get away from all the technology. No cell phones or tv to distract us from nature. Really... I love taking my child home at the end of the day. Home... safe and sound. BTW... I don't have facebook. Hope that's not a problem. We love traveling & road trips - favorite travel spot thus far? THE BEACH! And boy does Lincoln LOVE, LOVE LOVE it. This sure would come in handy especially for our 3 week trip out west this spring!! We love taking our baby to the cabin on the lake. This would be perfect for our trip!!! My favorite place to take my daughter, and will also take my baby on the way, is to our back yard to view the stars. favorite place would be the creek near our house. our babe will finally be big enough to dip her feet in and splash in it by spring! I love taking my baby to his grandma's house!! love traveling anywhere with kiddos, they are full of adventure; mainly Chicago and Montana to see family! my first baby will be here in in just a few weeks so I am not sure where all we will travel! I love taking my little one to families houses in Colorado and NY. We live in Vegas. We also love to spend time outdoors either hiking or at the park.. Even though my little one isn't here yet, I know it will be to visit family who live out of state. One of our family's favorite outings in warmer months is going to outdoor concerts and picnics in the parks. In winter months, our favorite vacation spots (for now) are generally visiting family. For both, this Lotus Travel Crib would be perfect for the new baby (due in March with baby #3)! I love to take my daughter to the park, and will love to take my baby on the way as well! Central Park and for sleepovers at her little cousin's in Brooklyn :) We walk or take the train to these places, so the Lotus cub would be perfect for us! We love taking our son to the beach!! He loves the sights and different textures and colors. We can't wait to take him to the beautiful Jersey Shore this summer and this travel crib would be perfect! Love talking long walks on the boardwalk at the beach near our house. I love taking my nephew to swim in the tub. This wold be a great gift for him as his parents are looking at pack'n'plays at the moment, but would love to have this better alternative without all those pesky toxins. Everywhere! My boys are very flexible. My 18mth old has type 1 diabetes and his doctor is an hour away so we are always traveling! We take our little bundle of joy everywhere we can...we want to travel to nana's house, but it is just to hard to travel with all the items that you need...and now that we are expecting another child it will be even harder...this is such a brilliant idea for traveling far from home...thank you for the chance to win this amazing product! My daughter has special needs, but she loves to go places and meet new people. Since she still can't sit or stand (at two) I often have to keep her in my arms places to keep her safe from other children and animals the floor at other people's houses. But she wants to be on her own! We love to go camping!! This would be a great addition!! My baby is expected april of this year,...I'm hoping she will love the water as I'd like to take her to the pool! 1) I'm a newsletter subscriber 2) I follow on Facebook (Michelle Hudak) and Twitter (auntiethesis) I love going to my city indoor pool with my daughter; we have a blast in the water and it always manages to tire her out so she naps when we get home. We're expecting our first in a couple of months. I'm looking forward to walking down to the neighborhood park with him and hanging out by the pond. We Love to take our baby to the local lake parks in the Orlando Area! On long walks, pretty much anywhere. To the park and zoo are the favorites! My favorite place to take my beautiful baby girl is to the zoo to enjoy the animals and the scenery. My favourite place to take my baby will be our weaving guild. Our favorite place to take our daughter is a few hours away to her Grandma's house. There's no place like home, with a cozy fireplace and the love of family surrounding her. Our favorite place to take our baby is to NYC. She loves to look at everything. I can't wait for the spring/summer. My two year old son and my 4 month old daughter are going to go out on A LOT of picnics and hang by the lake!!!! I wish I had the luxury of a play yard..considering now I have TWO kids. I love taking our baby to my parents house, we always have fun! I love to take Jaco to Victoria park. Its a few blocks away, has some beautiful trees to offer shade and is always full of friends from the neighbourhood. Our favourite place to take our baby is to Granny and Papa's and to Baba and Gigi's! email subscriber fb fan tony l smoaks twitter follower @fdp4life we love to go to the dog park with our fur babies and our babies!! anywhere! especially outside when the weather's nice! We love taking our son Ke'ohi to beach 69 and Hapuna. He loves the water, being the water dragon baby he is. We also like flying to O'ahu to visit tutu and grandpa and check out the beaches there! A travel playpen would be perfect to bring on the plane! Living in San Diego, the outdoors is like one big open park. Although I am only 8 weeks pregnant ( and have come to the realization that almost everything baby related is expensive), I am sure that I will have the opportunity to use this crib almost everyday once the baby(or babies don't know yet) comes. Visiting family, especially my mum. They are abroad, 22 hours away! Something light and handy would be wonderful. I like you on FB and follow you on twitter. My favourite place to take my baby is to the beach. My favorite place is taking my baby to Germany to see her grandparents, second would be the park. We love the outdoors! Wow!! What a great idea and a wonderful gift. I'd have to say all of the above ^ this sure would get us out more as a family... It's no easy task keeping your eyes on everything all the time. This would put any parent at ease knowing he/she is safe while your cooking or at the park or lake. Love the idea! We love taking our little one everywhere, and come spring are looking forward to introducing her to the Allegheny mountains! She's only 12 weeks old and it's been cold out, so our woods excursions have been limited so far, but the lotus would be awesome for all the family camping and travel we have planned for next spring and summer! We're on a family quest to visit every U.S. National Park. This would really come in handy when we're setting up camp!... and give mama's back a little break from all the baby wearing hikes. Our little guy is only 2 months old right now so it will get a lot of use. We can't wait to hit the road when it gets warmer. I love taking my baby everywhere! A papoose is a daily part of my wardrobe! I find a slow paced hike is the best place. Nothing is better than fresh mountain air. I love taking my baby everywhere, but we're visiting family in Hungary next summer and the Lotus would make life so much easier! I love taking him pretty much everywhere except stores! One of my favorite places for us to go is a bakery that sells a ton of vegan goodies. We won't need the playpen there, but it will definitely come in handy if we make it to Ireland to visit family later this year! my son loves to go see and sleepover at his greatgrandpa's place. I love seeing how my 12month old son can light up at smile on greatgrandpa's face. Hope to go see his greatgrandma in vietnam this summer for her 100th birthday!. I love to take my baby to the botanical gardens. She loves to look at all of the different colors. I would love to take my son to Paris to visit his mami, but at the moment I bring him on long nature walks so he can breathe the fresh air. I love to take my son everywhere! At 16 months he's been all over the U.S. and last summer he even got to meet my family in Spain! Love to take my babies everywhere! Especially to visit family!! We like to go to a play ground right next to a dog park. We like to go to a playground right next to a dog park. LOVE taking my kiddos out for walks and to the playground. I haven't had my baby yet (due in April) but I am excited to take her everywhere! Especially on some beach trips we have planned this summer! We love to go to grandma's house! Outdoors like parks to enjoy nature! I love to take her to her Grandmas! We don' have a travel crib and really want one. This travel crib is our dream version to have. We have heard wonderful things! Right now, everywhere! Due in September. The Beach! Little one loves the beach. I haven't had our little one yet; I'm due in September. I look forward to bringing our baby everywhere we go. When my husband isn't deployed and has to travel for work I follow along if I get the opportunity. We'll be doing to same with our little one so we can be together as a family. We love to take our daughter to the beach!! We love to take our baby everywhere with us. This crib will be especially handy when we visit family and friends as we often do. Thanks so much for the opportunity to win such a valuable product! I like to take my baby to visit our friends and relatives around the province. I'm entering this contest not for myself (I don't have a kid), but for my cousin that I take care of! He likes to go anywhere, especially the park. Hope we win! Such a great product. We love to take baby everywhere!! Especially on vacation and this crib would be awesome to have!! I love taking the baby to Grandma's house !!! I love taking our dd to the beach! We love taking our baby boy to the park and will be going to the zoo this spring! We love taking our baby boy to the park and will be going to the zoo and this Spring and the Yosemite this Summer for our family camp out! Our favorite place to take our baby is to visit family, hoping this crib will come in handy for that! Not sure if my comment will show up, but I cant miss this opportunity to enter and win! :) Can't wait to take our little baby to visit family spread out across the country, including some first time Great Grand Parents! Like to take my baby girl to the mall! We take our baby everywhere but Michael loves the park and when we visit family & friends! We are a military family. We love to go to the beach. We are going to be moving AGAIN to another tropical place. 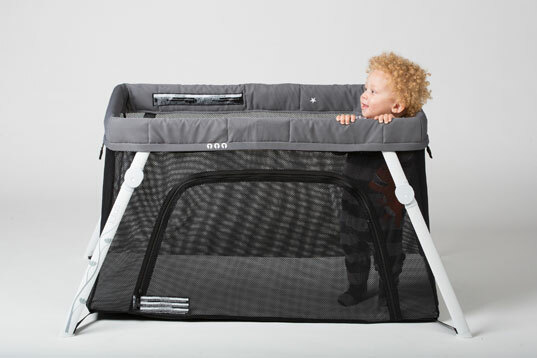 I have been looking for a new travel playpen for our little one on our adventures.